Some seniors in the “Baby Boomer” generation are deciding to finally get their teeth fixed after decades of managing life with crooked or crowded teeth. At their stage of life, they can better afford to spend some money on themselves and achieve the comfort and appearance that they want to have. As a teenager, Eddie Meisner was told that she would need braces. Her jaws were too small to hold all of her teeth, the dentist said. She would need to have two perfectly good teeth pulled out first, and then she would need to go through the process of having orthodontic braces. Meisner was living with her parents in Fort Wayne, Indiana at the time. Her family was not wealthy, and she knew that going through with the braces would put her parents under greater financial stress. She also resented the idea of losing two of her teeth, for no other reason than lack of space. After considering her options, Meisner decided to leave her teeth as they were. She lived with her teeth in crowded conditions for decades, until she was 66. Life took her to Bangor, Maine, where she visited a dentist who gave her an update on her teeth. “This past spring, my dentist said that because of the crowding in my mouth, my teeth would keep chipping as I get older and recommended orthodontia,” she said in an interview with the Bangor Daily News. Since her teeth were more fragile because of age, the likelihood of chips occurring had increased. It was enough to finally push Meisner over the edge. She decided to have the dental work done. In May of 2017, two of her teeth were extracted. In June, she began using Invisalign trays to straighten her teeth and relieve the crowding. The entire process will take about two years, since Meisner is in her sixties. She claims that she can already see and enjoy the difference in her appearance. In addition to improving the look of her smile, the work on her teeth will keep them from chipping and cracking. Instead of being crowded together and squished against each other, her teeth will have a little space between them, enabling her to floss correctly and minimise any tooth decay. Meisner’s story is like a host of others in the United States, in Singapore, and in other prosperous countries. People in their fifties and sixties are finally taking the time to correct their teeth, investing in their oral health and in their appearance. Many of them have paid for their own children to have braces, and they say that now it’s their turn. Some of the older adults who are having work done actually had braces as teenagers; but over the years, their teeth have moved out of position. The replacement of traditional braces with Invisalign trays is very appealing to many of these Baby Boomers. They don’t want brackets and wires, but they are okay with the nearly-invisible clear aligners. 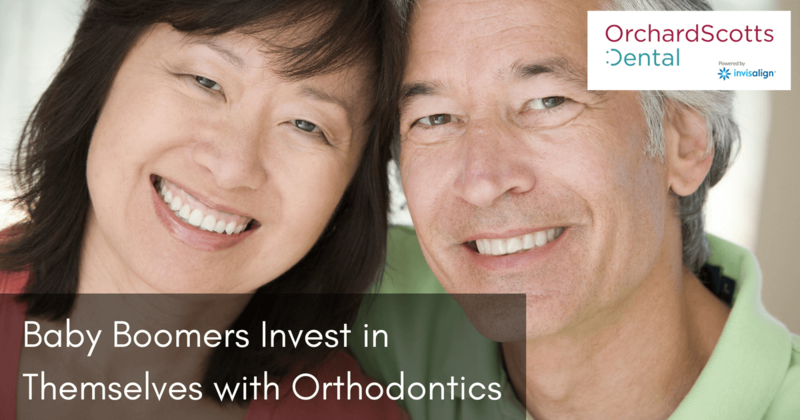 Are you an older adult looking for an orthodontic solution? Come to Orchard Scotts Dental, one of the top dental clinics in Singapore. We’ll give you an update on the situation with your teeth and show you all the options for achieving the smile you deserve.